You don’t have to cook to enjoy the benefits of coconut oil. You can use coconut oil on your hair and skin, too. 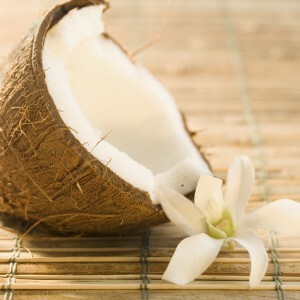 Coconut oil is already used in a wide of variety of cosmetics and beauty products. Skip the middle man and get coconut oil beauty benefits right from the jar. Coconut oil has a unique chemical structure that makes proteins, minerals, and other coconut oil nutrients absorb easily into hair, skin, and nails. That means you get maximum health and beauty benefits with very little effort. Here are three coconut oil beauty tips you can start taking advantage of today. Use coconut oil right from the jar for soft, smooth, radiant skin. Commercial moisturizers rely on water to make your skin feel soft. But the water evaporates and your skin soon dries out. Or they use petroleum products which clog pores and prevent the skin from breathing. Coconut oil is readily absorbed into the skin. So is the protein and vitamins that help your skin feel soft, smooth, and healthy. Rub coconut oil into your cuticles and fingertips. Coconut oil helps prevent drying and cracking, especially in dry, cold, or otherwise harsh environments. The protein and vitamins in coconut oil also benefit your hair. Add moisture, volume, and shine to your hair by conditioning your hair with coconut oil once a week. Coat your hair roots to the ends with a small amount of coconut oil. Cover your hair with a shower cap to minimize any mess and enhance the absorption of the oil into the hair. Leave the coconut oil in your hair for one hour. After the hour is up, wash your hair with a mild shampoo, and then style it as you normally would. Coconut oil makes you feel good all over and it makes you smell good, too! For more ideas about using coconut oil as a beauty treatment, check out these 16 tips from Seventeen magazine. Amy on Why Coconut Oil?